In case you just couldn't get up in time to catch it, here's my spot from 25 News Today earlier this morning, with Garry Moore and Jessica Cook sitting in for Gina. Tickets are now available for my Magical Moments: Up Close and Personal dinner show event on September 25 at New Amsterdam in Peoria. This is an exclusive show with extremely limited seating, so don't wait and miss out! If you reserve tickets in advance, you can save $10 off the price of each admission. Purchase your tickets today by calling New Amsterdam at 309-439-9099 or stopping by in person at 120 SW Water St. in Peoria. 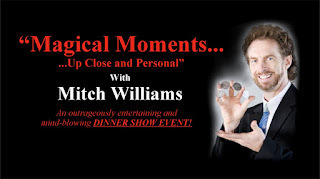 For additional information on the show, visit: www.mitchwilliamsmagic.com/MagicalMoments. Oh, and be sure to watch for me this Thursday morning on News 25 Today around 5:50 AM on WEEK-TV 25.